The Blue Ocean Pipeline Run Details view shows the information related to a single Pipeline Run and allows users to edit or replay that run. Below is a detailed overview of the parts of the Run Details view. Run Status - This icon, along with the background color of the top menu bar, indicates the status of this Pipeline run. Pipeline Name - The name of this run’s Pipeline. Run Number - The id number for this Pipeline run. Id numbers unique for each Branch (and Pull Request) of a Pipeline. Tab Selector - View one of the detail tabs for this run. The default is "Pipeline". Re-run Pipeline - Execute this run’s Pipeline again. Edit Pipeline - Open this run’s Pipeline in the Pipeline Editor. Go to Classic - Switch to the "Classic" UI view of the details for this run. 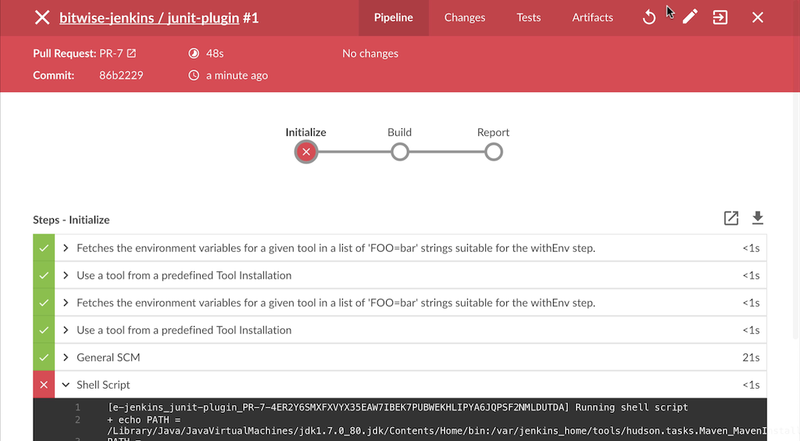 Close Details - This closes the Details view and returns the user to the <<activity, Activity view> for this Pipeline. Branch or Pull Request - the branch or pull request for this run. Commit Id - Commit id for this run. Duration - The duration of this run. Completed Time - How long ago the this run completed. Change Author - Names of the authors with changes in this run. Tab View - Shows the information for the selected tab. Blue Ocean makes it easy to see the status of the current Pipeline Run by changing the color of the top menu bar to match the status: blue for "In progress", green for "Passed", yellow for "Unstable", red for "Failed", and gray for "Aborted". 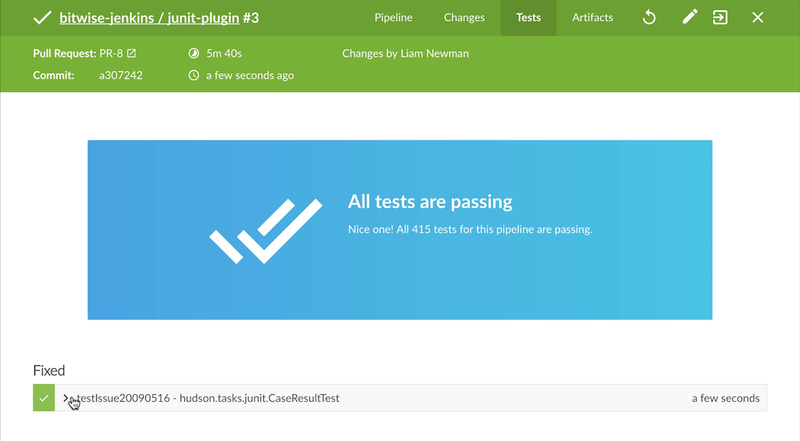 Blue Ocean is optimized for working with Pipelines in Source Control, but it can display details for other kinds of projects as well. Blue Ocean offers the same tabs for all supported projects types, but those tabs may display different information. For Pipelines that are not based on Source Control, Blue Ocean still shows the "Commit Id", "Branch", and "Changes", but those fields are left blank. In this case, the top menu bar does not include the "Edit" option. For Freestyle projects, Blue Ocean still offers the same tabs, but the Pipeline tab only shows the console log output. The "Rerun" or "Edit" options are also not shown in the top menu bar. Matrix projects are not supported in Blue Ocean. Viewing a Matrix project will redirect to the "Classic UI" view for that project. Each of the tabs of the Run Detail view provides information on a specific aspect of a run. This is the default tab and gives an overall view of the flow of this Pipeline Run. It shows each stage and parallel branch, the steps in those stages, and the console output from those steps. The overview image above shows a successful Pipeline run. If a particular step during the run fails, this tab will automatically default to showing the console log from the failed step. The image below shows a failed Run. The "Tests" tab shows information about test results for this run. This tab will only contain information if a test result publishing step, such as the "Publish JUnit test results" (junit) step. If no results are recorded this table will say that, If all tests pass, this tab will report the total number of passing tests. In the case of failures, the tab will display logs details from the failures as shown below. When the previous Run had failures and the current run fixes those failures, this tab will note the fixed texts and display their logs as well. The "Artifacts" tabs show a list of any artifacts saved using the "Archive Artifacts" (archive) step. Clicking on a item in the list will download it. The full output log from the Run can be downloaded from this list.